If you’re looking for a pistol to carry and you want something that delivers uncompromising firepower and unusual capacity, look no farther than the XD® 4” Compact. The XD® 4” Compact has the same superior ergonomics, reliable performance, and features that make the XD® easy and intuitive to use in a slightly abbreviated big-bore (.45 ACP) package. The XD® 4” Compact has a four inch barrel mated with a shortened compact frame. When combined with the versatility of X-Tension™ magazines, the XD® 4” Compact is ready for daily carry or a day on the range. Put in an X-Tension™ magazine, and you have a 13 round full-sized .45 ACP pistol. Use the flush-fitting 10 round magazine, and you have a Compact. 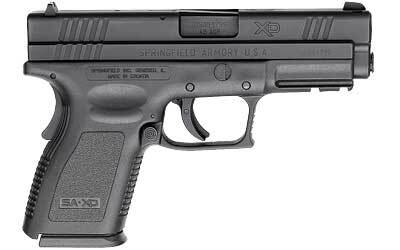 Of course, the XD® 4” Compact has all the features that make Springfield’s XD®’s easy to use and safe to handle. The striker status indicator, loaded chamber indicator, grip safety, Ultra Safety Assurance (USA) Action Trigger System™ and internal firing pin block bring the safety and usability to the XD® 4” Compact that you’re used to with every other XD®. If you want a gun for your inside-the-waistband holster and a gun for your range bag, but you only want to buy one gun, try the XD® 4” Compact. You’ll be amazed at how controllable it is to shoot and how easy it is to conceal. It’s two guns in one. These pistols are like new comes with one mag and original case.